The traditional business model of collecting an upfront premium for an app must have looked like a tasty appetizer — because software seems to have eaten its hors d’oeuvre and is now washing it down with a tall glass of freemium. Many apps today are free, relying on advertising and in-app purchases to sustain the company’s business model. 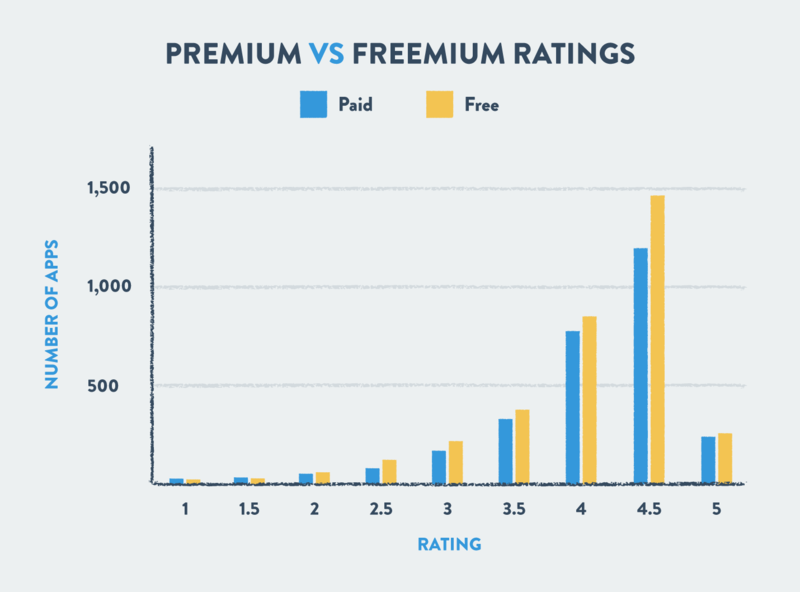 But in a freemium world, is premium still a viable business model? In this data study of more than 3,900 premium apps on both Apple’s App Store and Google Play, we look at pricing, ratings, and storage space requirements across industries. Continue reading for all our insights into a premium app strategy or jump to our infographic below. Somewhat surprisingly, we discovered that over 43% of apps in the App Store are premium. Compare this to the less than 8% of apps on Google Play that are paid. 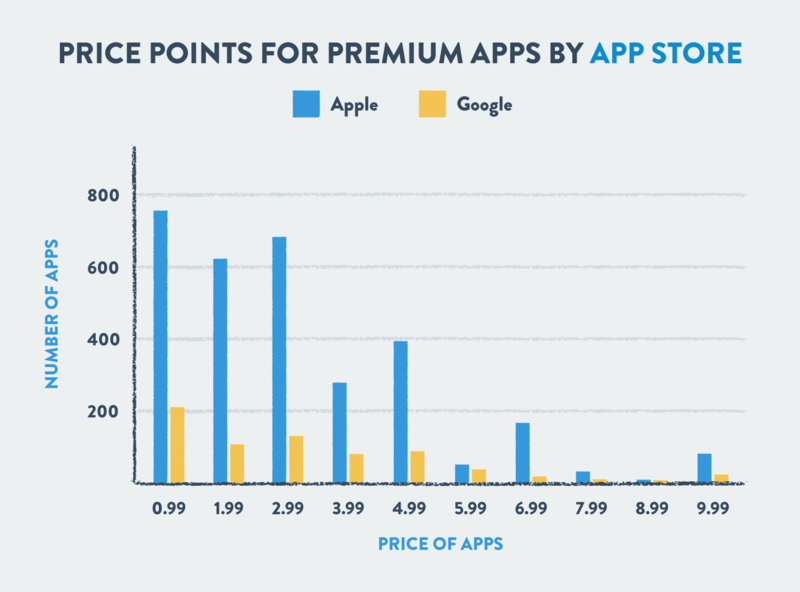 The price points of premium apps, as you might expect, are densely populated along the border of freemium. In fact, 86% of premium apps in the App store and 76% in Google Play cost less than $5. When analyzing the pricing models of premium apps in both the App Store and Google Play stores, it’s clearly a race to the bottom. 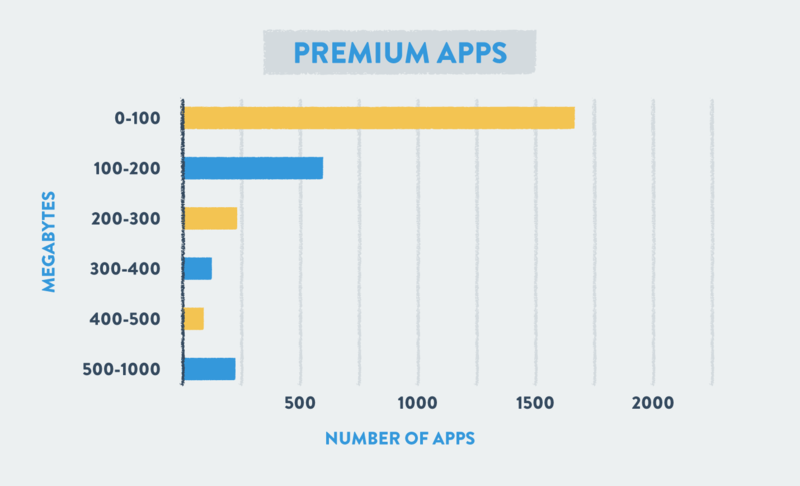 More than 62% of premium apps are priced between $0.99 and $2.99. Interestingly, $8.99 is the least common price point for apps under $10 comprising only 0.36% of paid apps. Do you trust Yelp ratings? What about Amazon’s 5-star reviews? App store ratings are no different. Obviously, every app wants hundreds of 5-star ratings, but their fate ultimately lies in the hands of users. This impartial voting system allows people to share their honest opinion, whether positive or negative. The good news for apps? App ratings across the board are weighted heavily toward the upper end of 5 stars. In fact, more than 76% of the 6,000+ apps from the App Store and 78% of the 9,000+ apps from Google Play in this study are rated 4 stars and above. This could be the result of a cognitive bias known as the post-purchase rationalization.4 This is the tendency for purchasers to overlook faults in a product to rationalize their expense. We are living in an era of big data, and it’s only getting bigger. 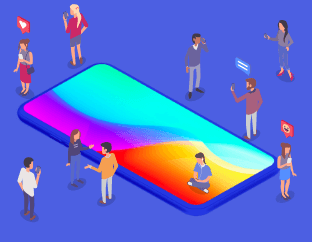 Every day mobile app users send millions of texts, take millions of pictures, and use millions of gigabytes of data.5 This puts pressure on the already limited storage space available to smartphone users. When we pay for apps, are we paying for increased functionality, requiring larger package sizes? Or are we paying for compactness? We analyzed more than 4,000 free and 3,000 paid apps within the app stores to compare package sizes. 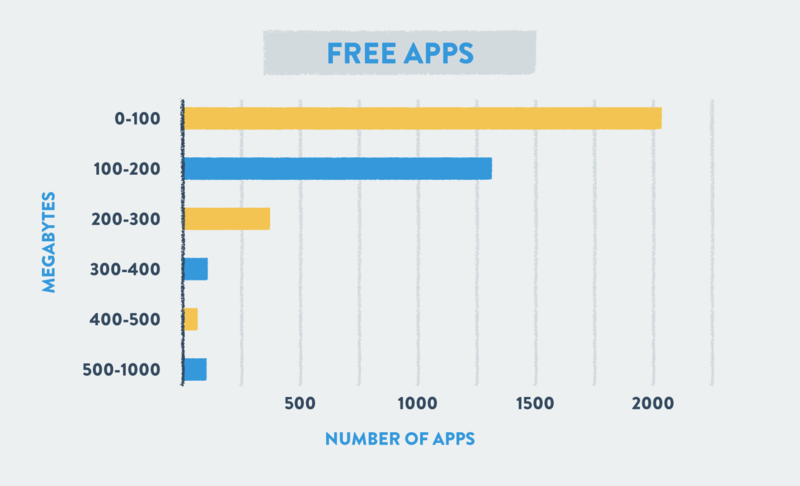 As you can see, the majority of free apps are less than 100 megabytes (MB) with very few exceeding 300 MB. Premium apps, however, require a bit more storage on average. In fact, the average premium app requires 265 MB of storage capacity, while the average free app requires only 147 MB of storage. As you compare the chart of free app sizes above to premium app sizes below, you’ll notice the wider distribution premium apps have on the scale, with a spike in concentration between 500-1000 MB. The largest premium app within the App Store is the game ROME: Total War that consumes more than 4 GB of space for $9.99. When you consider the latest iPhone costs $999 for 64 GB of storage, this app is consuming more than $62 worth of storage space. But not all premium apps are created equal. The smallest premium app is an educational product called GraphModeling that requires less than 1 MB of storage; 0.59 MB to be precise. Size is a huge component of the mobile app user experience. In a recent survey, more than 58% of users reported no longer using an app and limited storage space as the top reasons for uninstalling apps. What are users looking for when purchasing apps? Many apps today, Facebook being the most popular, have admitted to using psychology to create app experiences that borderline addiction. These addictive apps are essentially built to hook new users and keep them engaged. 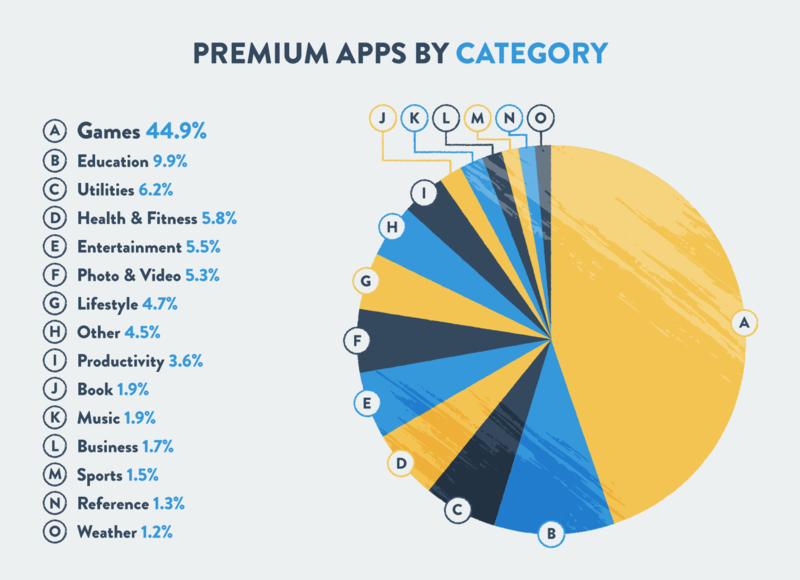 Looking at the industry breakdown of premium apps, you’ll find a majority are games. In fact, if you combine the games, entertainment, and lifestyle app categories, they comprise more than 55% of the Apple and Google Play app stores. Productivity, books, and business make up a smaller percentage, yet tools for education and health make up over 15% of premium apps. Use a premium model on the App Store, Freemium on Google Play. Test price points between $0.99 and $4.99. Keep app size below 200 MB. Maintain a 4-star rating and above. All of these factors contribute to your app store optimization strategy that will place your premium app on a solid footing to succeed. If you begin to see a decline in engagement, ratings, retention, and a subsequent increase in uninstalls, consider using CleverTap’s uninstall tracking to gain powerful insights into warning signs of churn and win back your lost users. We were then able to filter out free apps to analyze only premium apps for factors of price point, rating, size, and category. We were also able to draw conclusions about ratings and size compared to free apps within both major app stores.